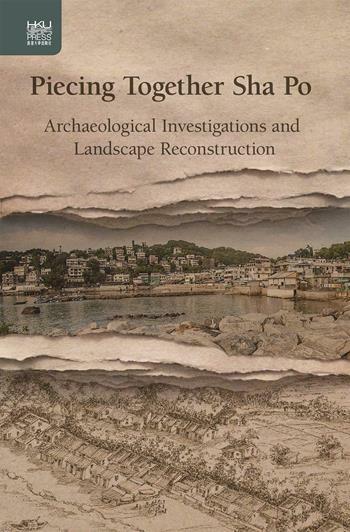 Hong Kong, Hong Kong University Press, 2017, 260 p.
Piecing Together Sha Po is an archaeological publication that traces the 6,500-year-old human occupation of Sha Po, a coastal village in the north-west of Lamma Island in Hong Kong. The authors, Mick Atha and Kennis Yip, who have lived on the island for the past ten years, are both archaeologists who trained in York, England. The former teaches his discipline at the Chinese University of Hong Kong while the latter is a professional consultant in archaeology. Having carried out numerous excavations there, they relied on their experience as well as on what they call “grey literature” to gather all the archaeological knowledge concerning this small village. Unlike the majority of publications on Hong Kong archaeology, this book does not attempt to produce general conclusions about a specific period of time by comparing the discoveries from a large number of sites, but instead aims to locate the results from just under a century of Sha Po’s archaeological excavations in their surroundings. This methodological stance is typical of environmental archaeology, in which the authors were trained in the UK, as it advocates the historical reconstruction of both ancient societies and their environments. This landscape approach brings a double originality to the book. Scientifically, of course, it enables the reinterpretation of objects already exhumed in the light of archaeogeography in order to better situate existing socio-cultural narratives within their environments. Culturally, it emphasises Hong Kong’s landscapes, whose heritage value has been largely neglected by urban planning. Although it adds some complexity to the book, the authors have pursued two ambitions. First, in order to contribute to contemporary scientific debates, they prudently base their conclusions on a complex assembly of archaeological evidence. To this end, a detailed catalogue of exhumed objects is given in the appendix and is supplemented by an extensive bibliography. Secondly, they strive to attract the interest of a neophyte public by producing a captivating narrative. A very large number of illustrations accompany the text, which is free of archaeological jargon. The nine chapters that compose the book are divided into three unequal parts. The first and relatively short part seeks to contextualise the object of study. Its first chapter situates the village of Sha Po in time and space by describing its recent history, geography, and topographic and geological features. Serving as an introduction, it ends with a succinct presentation of all the chapters of the book. The second chapter, “How we know about ancient Sha Po,” traces the history of archaeological excavations on Lamma Island from the first pots picked up off the ground by an Irish priest, Father Finn, in the 1930s, to salvage operations organised by the Hong Kong Archaeological Society in the decades following the Second World War. It was not until 1976 that the government regulated the profession, and only after 1998 were excavations systematically carried out before any building took place in areas of archaeological interest such as Yung Shue Wan, of which the former village of Sha Po is part. It was during this last period that the authors carried out the major part of their excavations and acquired their expertise. The third chapter presents the landscape approach of the book by introducing the notion of social landscape. Indeed, the landscape is the result of environmental transformations by Sha Po’s successive inhabitants over several millennia. It is important to understand this difference, both environmental and cultural, in order to grasp the authors’ reconstruction efforts and the difficulties of interpretation they have faced. This chapter then traces backward the history of Sha Po’s landscapes, from the peasant villages of the nineteenth century to the beaches of the Neolithic. The second part is the most substantial in the book, and sets out to narrate, chronologically and with supporting archaeological evidence, the 6,000-year history of Sha Po and its inhabitants. The occupation of Hong Kong dates back some 7,000 years, and Sha Po provides evidence of human activity as early as 4500 BCE. The first chapter examines the Neolithic period and describes a fisher-hunter-gatherer population probably seasonally settled on the sandbanks behind the beaches. The second chapter shows the importance of the site in the Bronze Age by the discovery of two prehistoric industries: bronze casting on the backbeach and the polishing of earrings, made from quartz extracted further inland, at a workshop situated on a small rocky promontory. In view of the circular pits found on this same site, the hypothesis of stilt houses is advanced. Chapter Six traces the advent of the Chinese Empire in the third century BCE and the annexation of Hong Kong in the second century AD by the Western Han, which marks the region’s entry into history. Entitled “On the edge of empire: Han-Yuan Sha Po,” it covers 1,000 years of progressive integration of Hong Kong into the Chinese Empire. Despite great uncertainty about the types of construction and the practice of agriculture, a careful study of the archaeological remains allows the authors to reconstruct the social landscape of Sha Po, such as location of graves, diet, and economic activities. This chapter also attempts to demonstrate the use of the dozens of circular kilns found on almost all beaches in Hong Kong, dating back to the first millennium CE, and still controversial among archaeologists. They seem to have been used for the production of salt, a highly profitable imperial monopoly, which together with pearl fishing deeply impacted the environment, mainly through deforestation. Chapter Seven extends from the Ming Dynasty to the colonial period, mainly marked by a significant Chinese immigration from the mainland, who introduced not only in Hong Kong generally, but also in the Sha Po Valley in particular, rice farming as well as other Chinese cultural features, including feng shui. These agricultural landscapes were taken over by the British at the end of the nineteenth century and are now disappearing from Lamma Island under the increasing pressure of real estate development. The last part serves as a conclusion in two chapters. Providing an overview, the first chronologically summarises 6,000 years of Sha Po history in order to reconstruct the landscapes and ways of life of the inhabitants. The geomorphological transformations of the valley are described by means of a series of maps and stratigraphic sections. The most effective reconstructions remain the three illustrations by the artist Dina Knight. These are three bird’s-eye views taken from the same angle in three epochs: the Bronze Age, the Six Dynasties to the Tang period, and from the end of the nineteenth to the beginning of the twentieth century. They allow the appreciation of environmental changes (the size of the beach, changes in watercourses, deforestation, location of stilt villages) as well as activities specific to each period (fishing, hunting, bronze casting, quartz workshop, salt kilns, maritime trade, and finally agriculture, temple, etc.). Chapter Nine concludes with the importance of Sha Po’s case for archaeology in the region, but also with the work that remains to be done, speculating on the discoveries to come. Maxime Decaudin is a PhD student in Art History at the University of Paris-Sorbonne, and a lecturer in landscape architecture at the University of Hong Kong (maximed@hku.hk).